Now that the garden is in, its time to keep it looking great with a few mid-summer vegetable garden tips! So much work goes into spring planting we sometimes forget that once summer arrives, there is still work to do. The real key is to keep at it a little every day. Before you know it, you will be harvesting those long-awaited vegetables and enjoying home-grown food! 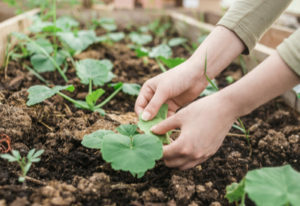 Here are 5 big summertime vegetable garden tips that are sure to keep your plants growing strong! One of the best vegetable garden tips of all is to walk and work in your garden a little every day! Remember that garden you planted with enthusiasm just a few weeks ago? It needs you. The only way to protect and nurture a vegetable garden is to know exactly what is going on in it, every single day! A garden can be attacked by a new pest or disease in a mere day or two. Left untouched, a small pest or diseased plant can turn an otherwise healthy garden into a disaster in a flash. And when it comes to weeds, a mini jungle can form seemingly overnight. The mother of all vegetable gardening tips is to simply spend a little time each day checking on your garden. Spending 5 to 10 minutes strolling through to check plants and pull tiny weeds makes garden life easy. It can keep problems small and harvests big! And remember, 10 minutes each day is not the same as 70 minutes just one day a week. Problems, and the time you need to correct them, multiply quickly if left for days. Mulch in the garden is a huge key to success. 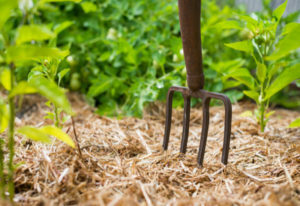 By keeping mulch around plants, you eliminate weeds and conserve moisture. Mulch also helps to regulate soil temperature, keeping the stress on plants at a minimum. And if you use compost as a mulch directly around plants, it provides incredible nutrients to plants as they grow. When you see plant damage, take care of it immediately. Trim off damaged limbs, branches and foliage before the problem spreads. It is so important to prune plants as they grow, especially underneath to allow air flow. Remove the lower 6″ of branches from tomatoes and peppers to let in the light and air. Trim off wild branches from all plants to keep the garden neat, and areas for pests and disease to hide at a minimum. 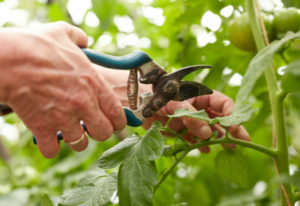 When it comes to vegetable garden tips – pruning plants is a big one! Vegetable plants use up the nutrients in the soil quickly, and can use a boost by mid-summer. One of the best ways to fertilize vegetable plants is by side dressing or mulching with compost. Compost is full of nutrients that leach into the soil and boost plants slowly and naturally. That slow release is the key, keeping plants growing steady and strong. If you really want long-lasting power, mix in a quarter cup of worm castings to the soil zone directly around plants. Worm castings are our #1 Secret when it comes to all natural fertilizing power for the garden. Product Link : Worm Castings. Here is to a great summer garden. Happy Gardening! Jim and Mary. ← The BEST Cucumber, Onion and Tomato Salad – So Refreshing!